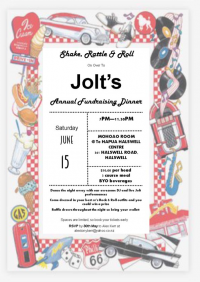 Join Jolt, a Christchurch dance company, for its annual fundraising dinner and dance on Saturday 15 June. The $50 tickets include a three-course meal and the chance to dance the night away with a DJ and live Jolt performances. Come dressed in your best 50s’ rock ‘n roll outfits and you could win a prize. Original generation time 1.8835 seconds. Cache Loaded in: 0.0333 seconds.